Renowned drone maker DJI has opened its first flagship retail store in Shenzhen, China. The 800-square-meter facility (around 8,611 square feet) features display areas, a repair center, theater, lounge and even an indoor test flight area manned by skilled DJI pilots. The store has models from its Inspire 1, Matrice 100, Guidance, Phantom 3 and Spreading Wings lines on display. Shoppers can also pick up the company's Ronin handheld camera gimbal line and its brand new stabilized 4K handheld camera, dubbed Osmo. DJI said the store's interior architecture was based on the concept of "yuan," a Chinese word that means "circular," as a symbolic gesture that reflects how DJI's drone propellers look while in motion. 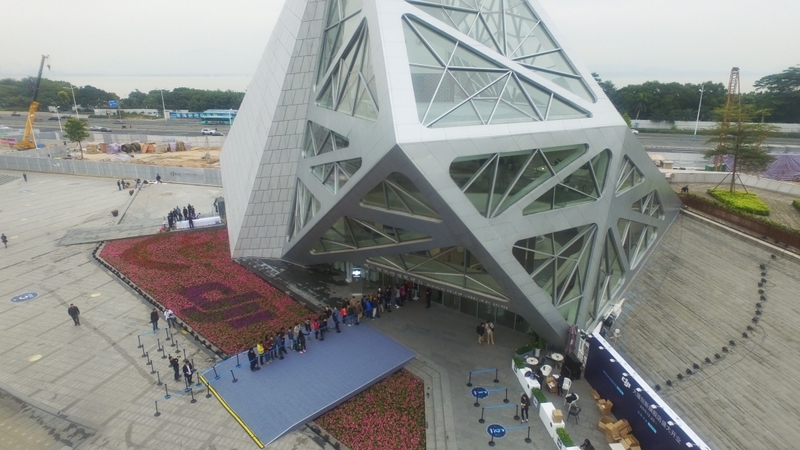 DJI CEO Frank Wang said the flagship experience is an important touchpoint to connect people with their cutting-edge technology and get a sneak peek into the future. Whether you want to learn how to fly or are a professional looking for the latest aerial imaging technology, Wang added, the flagship store will provide visitors with the opportunity to really experience the DJI brand up close and in person. Shenzhen was a natural choice for its first retail space as DJI's headquarters is based in the same city. For those in the area that want to have a look, the store is located at the Shenzhen Tourist Information Center at OCT Harbor.